Visual artist Fiona Tan’s Ascent (2016) is a collection of still photographs edited together that mirrors the construction of film as a single image at a time. The only difference is that Tan threads together still moments as opposed to the liberated movement of the filmic imagery, both within the frame and in its connection to the preceding and succeeding images. 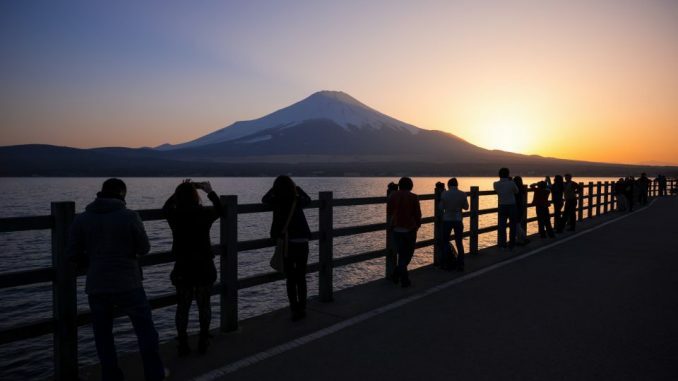 Ascent’s study of Mount Fuji in stillness offers not only an aesthetic experience, but one that touches upon the very nature of the still image. Tan has created a film that addresses a multitude of ideas, from our perception of stillness and our innate propensity to create movement in stillness, to the reasons we are aesthetically drawn to the form of a particular image. In conversation with Aesthetica at London’s Frith Street Gallery, Golden Square, Tan discussed the connection Ascent shares with her work and the ideas central to the making of the film. She also shared her thoughts on the relationship between photography, film and memory, and how the identity of our world is a human construct.